With only two days to soak it all in, you may have missed some great content. Let’s roll back the tape. In case you missed it, below are the most talked about sessions and speakers from HR Redefined 2018. Top-rated Wharton professor and Namely Advisor Adam Grant has spent his career studying ways to inspire original thinking. At last year’s HR Redefined, he affirmed without hesitation that HR is the lifeblood of this effort. “Original thinking and HR are not an oxymoron. You have the power to drive real change and define culture more than anyone else in your organization,” he said. In his keynote presentation, Grant shared how HR teams can leverage a culture of original thinking to better attract and retain employees. Omer Aziz, the former chief HR officer at FlightNetwork, shared how he discovered the secret to predicting employee turnover. Inspired by solutions presented at Namely’s 2017 Hackathon, Aziz created his own formula to determine when employees might be looking for a change of scenery. Aziz was able to predict six at-risk teammates just by using employee information stored in Namely. You don’t have to be an expert to know that blatantly asking about race or marital status goes against recruiting best practices. However, seemingly innocent questions can still be tied to a protected trait. Namely’s own compliance experts shared some of recruiting’s most common legal “gotchas” with roleplaying exercises that involved the whole audience. Benefits are a crucial piece of talent acquisition, engagement, and retention. At Namely’s 2018 HR Redefined conference, we brought together industry experts to share how HR teams could maximize their benefits offerings. They shared tips for providing comprehensive basic coverage, utilizing data to guide benefits decisions, and clearly communicating perks and offerings come open enrollment season. Mai Ton, the VP of Humans at White Ops, knows a thing or two about using HR data. She gave HR Redefined attendees actionable tips on how to leverage their organization's people data to gain executive buy-in. Citing examples from her 15-plus years in HR, Mai shared how technology, data, and a little personalization can make all the difference when presenting to execs. 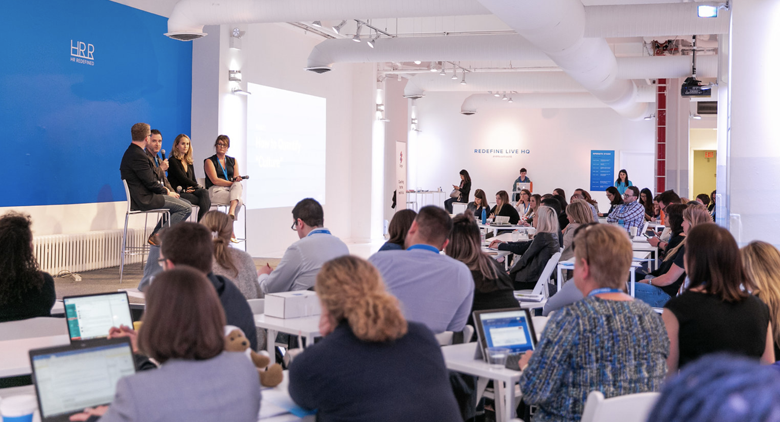 While last year’s HR Redefined conference will be hard to top, we’re thrilled to welcome a whole new lineup of industry experts and speakers this year. Don’t miss out on the excitement of HR Redefined 2019! Join us May 5-7, 2019 in New York City for even more amazing sessions and speakers. You’ll connect with HR professionals from all over the world, share strategies for engaging your employees, learn how to get the most out of your people data, and more. Early bird tickets are only available until February 15, so purchase your discounted tickets today! Thinking of Attending HR Redefined 2019?